Chicago's Pest House, also called the Smallpox Hospital, was built, destroyed, and replaced several times at approximately the same location. Situated near where North Avenue would one day extend to meet the lake, it was located at the Southeast corner of the City Cemetery, near the Potter's Field. The Pest House's name was derived from the word "pestilence." It was a contagious disease hospital where victims of cholera and smallpox would be kept in what seems to have been less than satisfactory conditions. 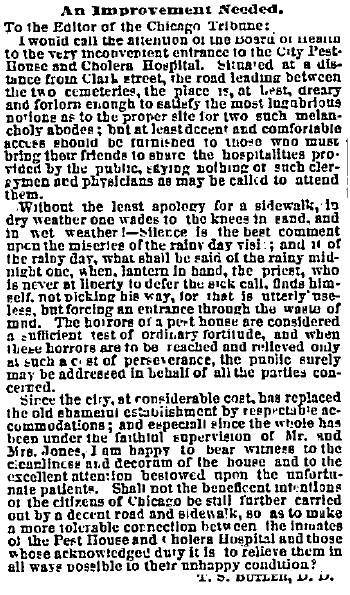 Included in this section are records and newspaper articles, and an 1864 portrayal of the conditions of the facility from the Chicago Medical Journal. 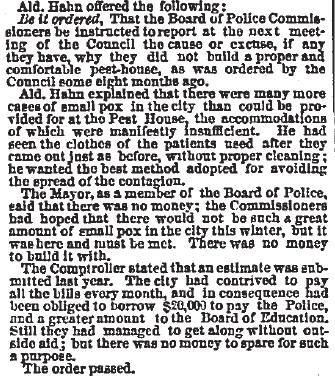 That the City Superintendent forthwith proceed to remove the pest house to within 40 feet of the south fence of the cemetery and that a fence at least 10 feet high be built on the west and north side of said house. It was in 1843 that the city or small-pox hospital was constructed, located just above North Avenue, near the lake shore, on the grounds purchased for a cemetery. In March, 1845, the building burned to the ground. The fire originated from some ashes which were carelessly left too near the building. Its burning was particularly unfortunate at this time, as there were several small-pox cases, and patients were then being treated in the pest house. Mayor Garrett had even issued a proclamation for general vaccination. 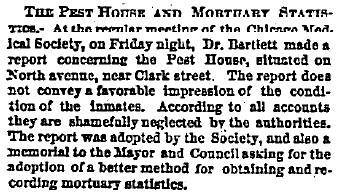 While another hospital was being erected on the same site, the patients were accommodated at the house of a Mr. Shaw, in the northeastern part of the city. From A.T. Andreas, History of Chicago, 1885, Volume II, page 536. 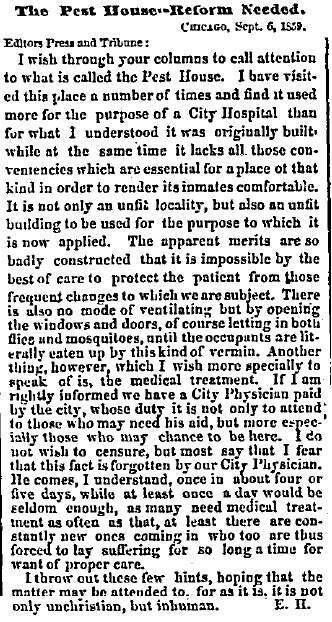 The small-pox hospital, in 1859 was on North Avenue, between Wolcott Street (now North State) and Lake Michigan, and Dr. William Wagner was the physician in charge. George B. Bay was the warden, Mrs. Clara F. Bay, the matron, and Miss Ann Anderson, assistant. This building remained at this location, and under this administration, until the year 1864, when a large and spacious building, costing $13,593.18, was erected, which contained twenty-four wards. It had a main building, two stories and basement, forty-eight by twenty-four feet, and two wings, each one story and basement, of thirty-two by sixty feet. This building was called Lake Hospital.